In this short tutorial I will be talking through how to add password protection to your WinSCP install. This adds encryption to all of your stored credentials and ensures the utmost security! 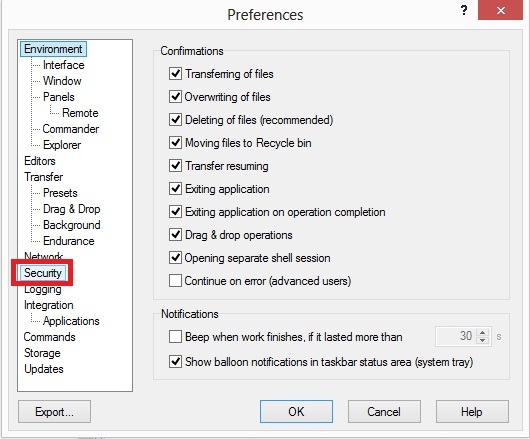 Step 1: Access the Preferences by going to Options->Preferences from within the main window. Step 2: Within Preferences there is a menu on the left hand side called ‘Security’; click on this. 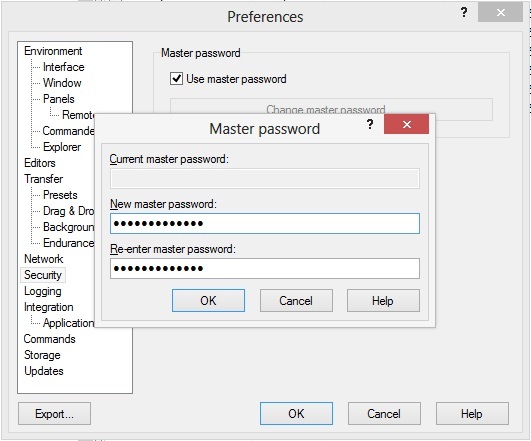 Step 3: Within the security menu click on the tick box which states “Use Master Password”, you will then be asked to create and confirm your master password. Note: Make sure to choose a at least 6 characters and a mix of letters numbers and symbols for the best security. Upon clicking ‘OK’ you will receive a confirmation dialogue box. Your passwords are now protected with AES encryption. You will be asked for the master password upon connecting to a stored session for the first time after program startup.